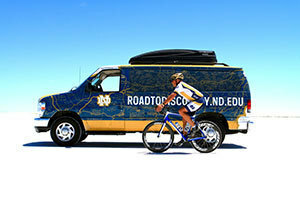 Gregory Crawford, dean of the College of Science at the University of Notre Dame, will embark on his fourth annual Road to Discovery bicycle ride on June 27 (Thursday) to raise funds for research to find a cure or treatments for Niemann-Pick Type C (NPC) disease. He will be biking 3,476 miles from Los Angeles to Baltimore and will arrive on Aug. 2. By the end of this year’s journey, he will have biked a total of more than 11,200 miles to raise awareness for the rare genetic disease. NPC is a cholesterol-storage disorder that primarily affects children before or during adolescence. The disease causes cholesterol to accumulate in the body’s cells and eventually leads to neurodegenerative problems that are always fatal. Legendary Notre Dame football coach Ara Parseghian lost three of his grandchildren to the devastating disease. With previous research funding from the Ara Parseghian Medical Research Foundation and the Charles Edison Fund, a group of Notre Dame researchers and their collaborators were able to identify novel medications that have shown promising results in treating NPC disease cells in the laboratory. The funds raised from this year’s ride will target support for a clinical trial to treat NPC patients with the disease. 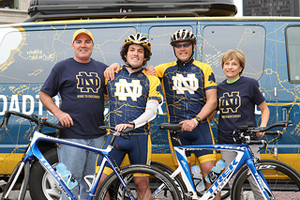 During the month-long bike trip, Crawford will meet with families affected by NPC, researchers, physicians and Notre Dame alumni clubs across the country. His trip will include events with the Notre Dame clubs of Ventura County, Los Angeles, San Diego, Phoenix, Tucson, Dallas, Houston, New Orleans, Mobile, Atlanta, Charleston, Raleigh, Washington, D.C., Baltimore and others. He will also meet with researchers, funding sources and collaborators. Crawford will arrive in Baltimore in time for the 21st Annual National Niemann-Pick Disease Foundation Family Support and Medical Conference. Before the ride begins, the College of Science and the Ara Parseghian Research Medical Foundation will host the Parseghian Classic, a golf fundraiser at Pebble Beach Resorts from June 21-24 in Pebble Beach, Calif. The proceeds will support NPC research and clinical trials. Visit Crawford’s daily blog to follow his journey and learn about the inspiring stories of those affected by NPC who he will meet along the way. Originally published by Stephanie Healey at news.nd.edu on June 18, 2013.